The primary purpose of calibration is to ensure that ball speeds and launch angles are measured accurately. is then placed at various vertical and horizontal angles. that will be used if users choose not to calibrate the cameras themselves. Why is calibration or correction required? and the Vcam is mounted at floor level either on the left or right hand side of the enclosure and views the ball in flight from the side. 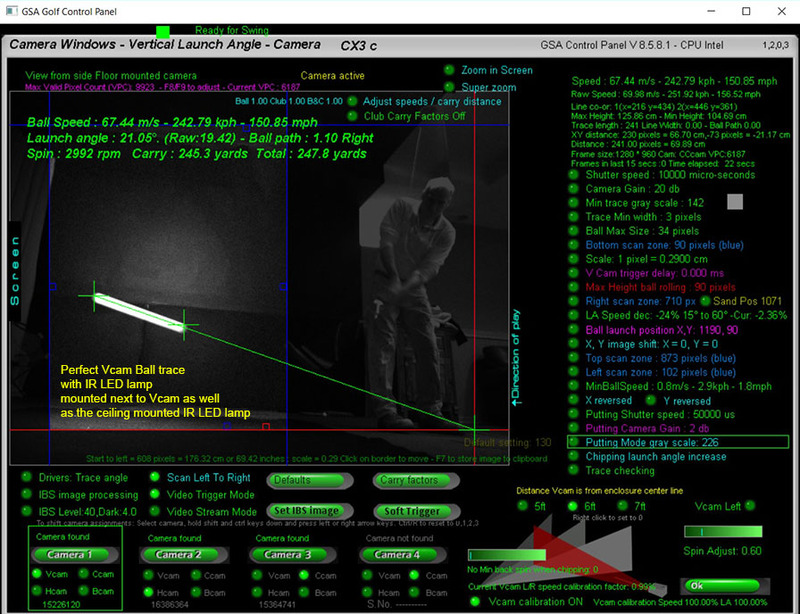 Note that the Vcam - in addition to measuring the vertical launch angle of the ball - also measures the speed of the ball based on the length of the ball trace. i.e. The length of the trace is directly proportional to the speed of the ball. As long as the ball is hit perfectly straight and low, this setup wouldn't require any calibration. Ball speed and launch angle (LA) accuracy problems occur when the ball is hit either left or right or higher. This is due to the ball being hit either further away or nearer to the cameras which causes the ball trace images to appear either larger or smaller. If not adjusted this ball trace size difference will distort the speed measurements. be measured higher than it actually is. The full calibration method uses pre-defined calibration tables like the above. 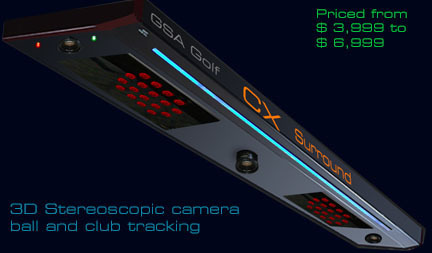 The tables are made by actually placing a white pole that represents a ball trace at various angles to the Vcam camera. In the above table, the camera was placed 5ft away from the center line of the enclosure and the pole is angled left and right in 1 degree increments. The calibration is reducing (instead if increasing) both the speed and LA as the ball path is right - towards the camera - and thus the ball traces will appear larger. The white row is the row selected by the edit cursor (Use up/down arrow keys to move). 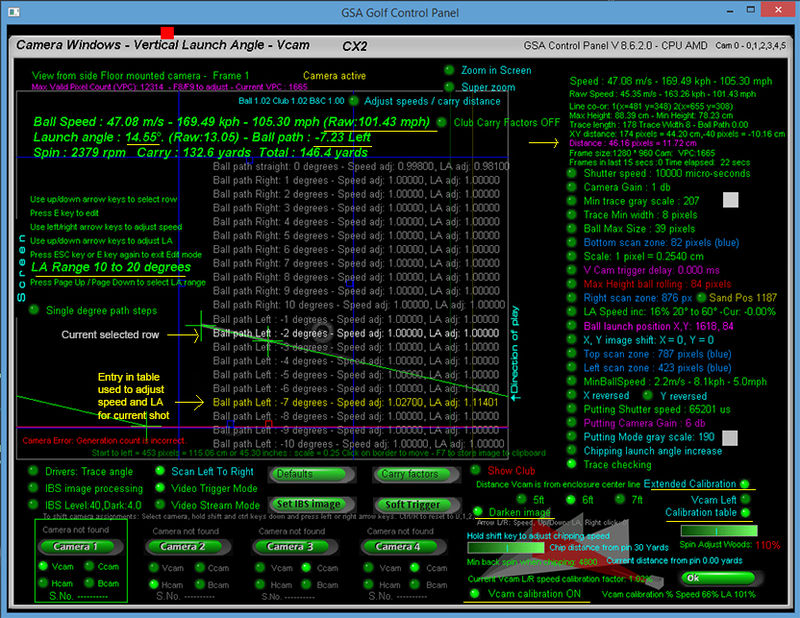 for 6 launch vertical angle ranges of 10, 20, 30, 40, 50 and 60 degrees. With the Vcam calibration switched OFF, a user defined percentage correction is used. flying left (i.e. away from the camera). If the ball path is 10 degrees then half the adjustment is used and if just 5 degrees then only a 1/4 is used. 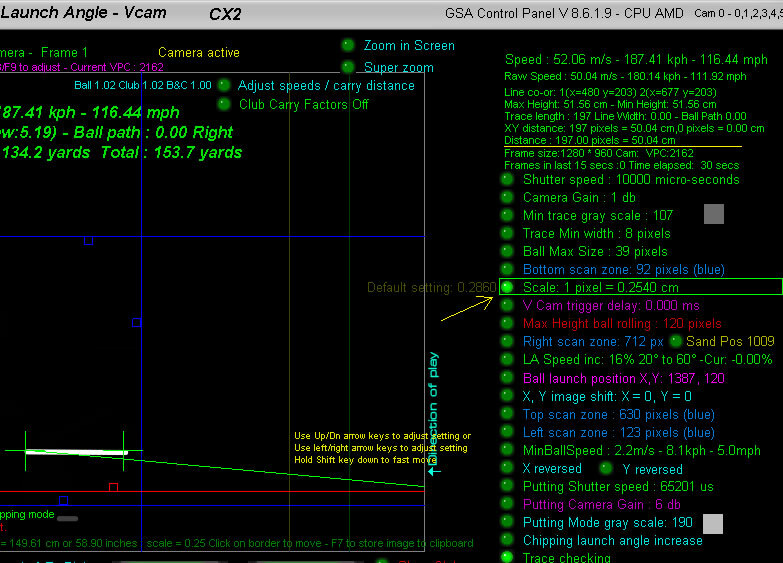 To-date all calibration and linear adjustments where made for the Vcam camera which is responsible for ball speed and vertical launch angle calculations. 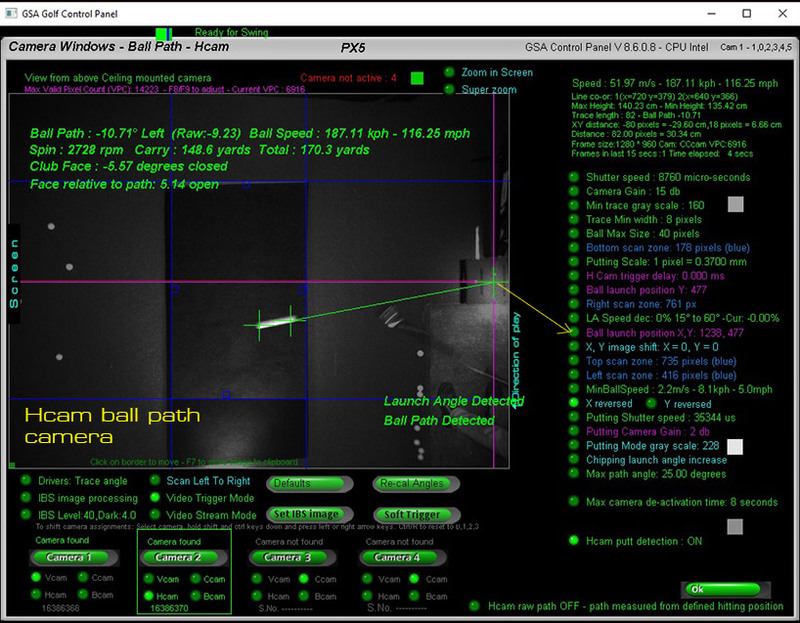 However, the Hcam ball path camera also requires either calibration or linear adjustment in order to calculate true ball path angles. Calibration tests showed that the Hcam will only detect true ball path angles when the ball vertical launch angle is below 20 degrees. As the vertical launch angle increases, the ball is getting nearer to the Hcam ceiling mounted camera and lens perspective distortions start to kick in. As can be seen, high lofted shots can result in ball paths being measured twice as much as they really are. i.e. a real path angle of 20 degrees, is measured as 40 degrees left or right without correction. 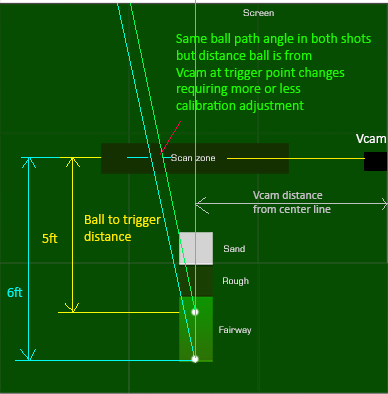 To correct this there's a new "Path correction" option in the Hcam window that linearly adjusts the path to it's correct value depending on the vertical launch of the ball. BTW, if you have noticed that some high lofted shots weren't being detected, then it was probably due to the ball path being measured by the Hcam exceeded the "Max ball path" setting in the Hcam window. Without path correction it would be very easy for the ball path to exceed the limit setting with high lofted shots and then the launch would be declared as invalid. 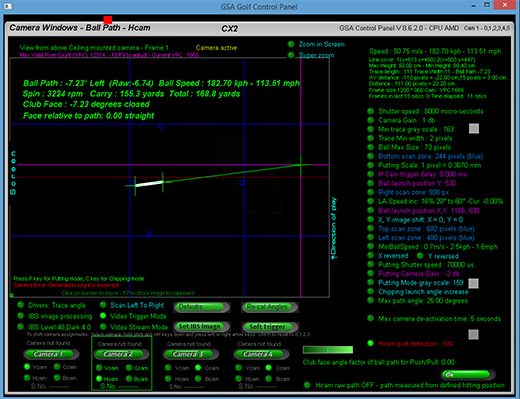 Even though the CP measures correct ball speed when chipping, these shots are often too long in the game software. 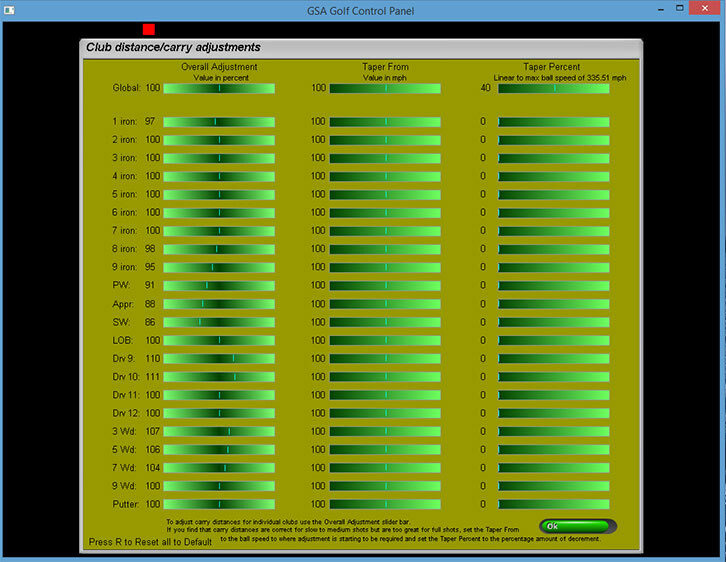 To correct this, you can set a ball speed adjustment percentage to reduce the speed of the ball. In the above example, the speed of the ball when chipping is reduced to 45.00% of the actual measured ball speed. but the distance the ball is to the pin is less than the user defined chip distance. To set the chip distance, hover the mouse cursor over the "Chip distance from pin" text and use left and right mouse clicks adjust the distance. In the above example the distance to the pin where the chipping mode will be automatically activated is set to 30 yards. "Min back spin when chipping"
In order to prevent the ball from rolling straight off the green when chipping, the back spin should be quite high. Use the spin adjust slider bar to increase or decrease the calculated spin rates. Note that spin rate adjustment settings are separate for irons and woods. Hold the shift key down to select irons, otherwise woods are selected. Some small tweeks were made to the Hcam path correction today and the new 7ft calibration table was made with Hcam correction ON. 5ft and 6ft tables didn't use the Hcam correction so will be redone mext week. In the meantime use the 7ft table even if your Vcam is closer or further away. When in Chipping Mode, the "min backspin when chipping" slider bar turns into .... "chip ball speed adjust"
and "Launch Angle inc" turns into "Chipping launch angle inc"
Note "Launch Angle inc" is not required when using "Extended Calibration". 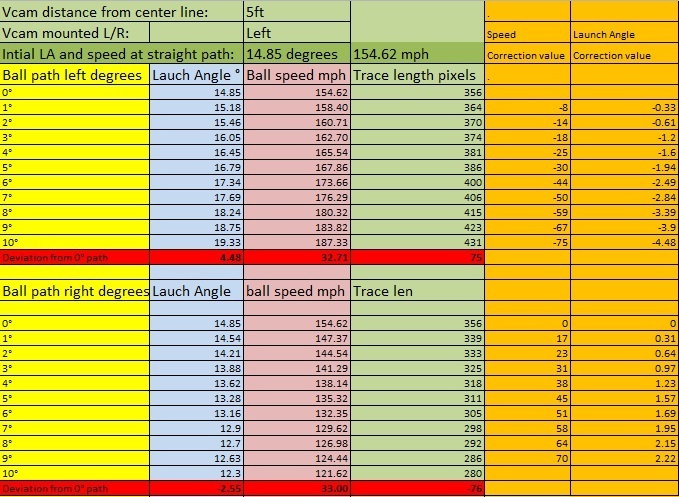 "Launch angle ball speed adjustments"
In addition to ball speed adjustments for balls flying left or right, there's also ball speed adjustments related to the launch angle of the ball. which in turn results in lower speed measurements. 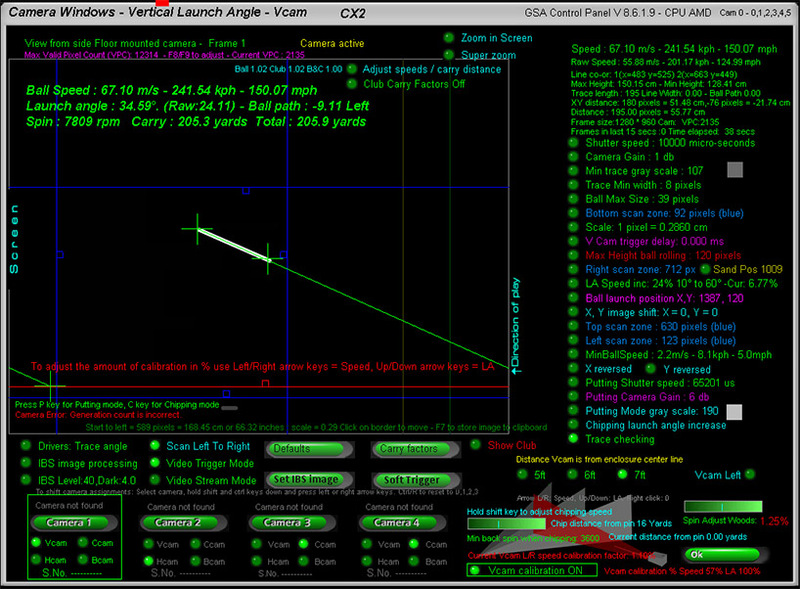 To correct this an "LA Speed" adjustment based on the launch angle of the ball can be set. In the above example, a max ball speed increase of 16% is set over an LA range of 20 to 60 degrees. This means that if the ball LA is below 20 degrees then no adjustment will be made but if higher then a percentage of the 16% will be applied to the ball speed. e.g. If the LA is 60 degrees then the full 16% will applied, if 40 degrees (i.e. halfway between 20 and 60 degrees) then there will only be an 8% (half of 16%) increase. 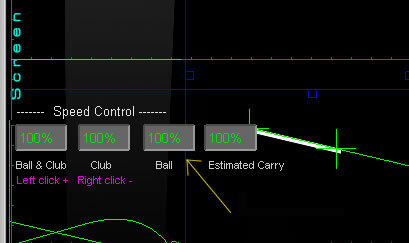 The CP calculates ball speed by the length of the ball trace of the shot. This conversion is done by the user defined "Scaling factor"
Most just use the default setting of 0.2860 but if you would like to be more exact then the following method should be used. 3. Adjust the scale factor so that the "Distance" is the same as the known length of the pole. 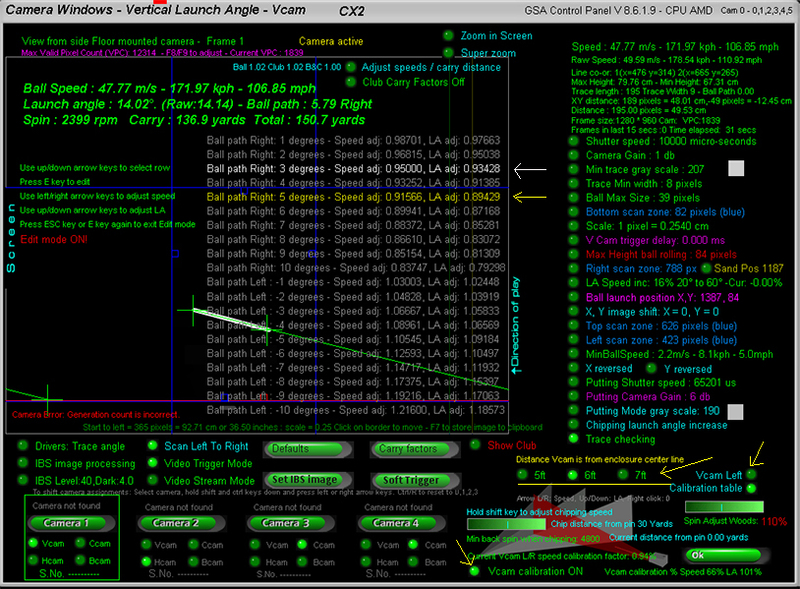 Click the "Carry Factors" button in the CP's Setup window to access this carry factors window. There's a new slider bar in the Vcam window that allows users to adjust the LA based carry and spin factors directly in the Vcam window and thus see the results of carry adjustment immediately. 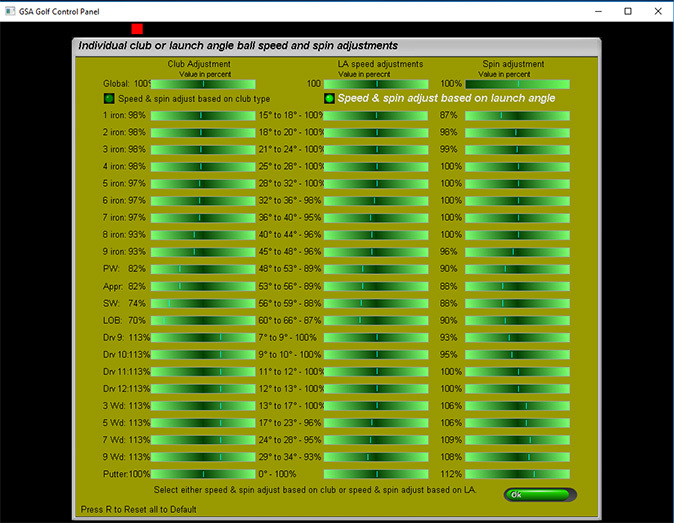 In addition to the carry & spin factors based on the club being used, there is now a carry (ball speed) factor and spin rate factor based on ball launch angles. This should be more accurate than the club based method as it cannot be what the launch angle is based on the club selection. Note that these carry and spin factors are either club or LA based and not both together. If "Carry factors" are switched OFF then neither will be used. The third column in the window is used to set spin rate factors for specific clubs or launch angles. Again, if "Carry factors" are switched OFF then these spin factors will not be used. Also note that the standard LA speed increase or decrease is still active in the Vcam window when selecting carry factors ON. Click the above image and scroll down to Q 16 to read more about standard LA speed adjustments. The calibration method here is to use a white tube of a known length on a pole that represents a ball trace at a constant speed which is then placed at various vertical and horizontal angles. and pinned down at the other end with a swivel mounted on a base plate at the usual ball hitting position on the hitting mat. Place the end of the rod in the hitting mat's tee holder hole. This represents the ball's initial position on the ground. and moved both left and right in 2 degree steps to simulate ball path from 20 degrees left to 20 degrees right. A tilt meter is used to measure the real angle of the rod and the Hcam is used to measure the ball path. Slide the white tube up or down as necessary to keep it in the same FOV of the camera with every step. This simulates the same trigger point. 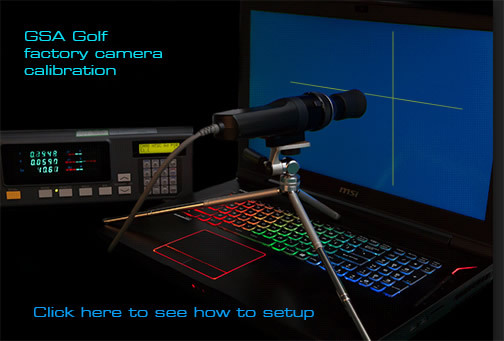 With each step, capture new V and H cam images of the rod by pressing the Enter key. Pressing the Enter key on your PC's keyboard sends "Soft trigger" instructions to both the V and H cams. Use blocks of some kind (e.g. step ladder, stools or chairs etc) to support the end of the rod to get the desired vertical angles. 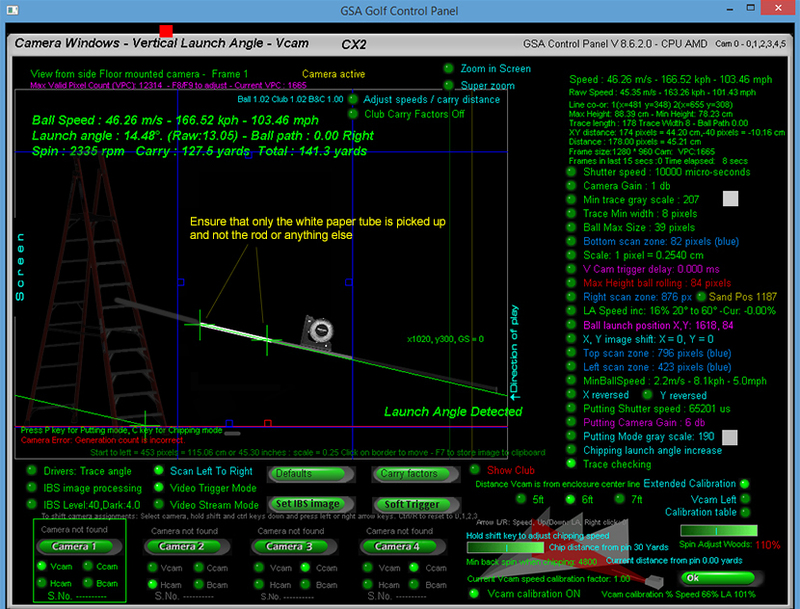 Ensure that the "Ball Launch Position" has been set correctly in the Hcam window. The above image shows the new extended calibration table. 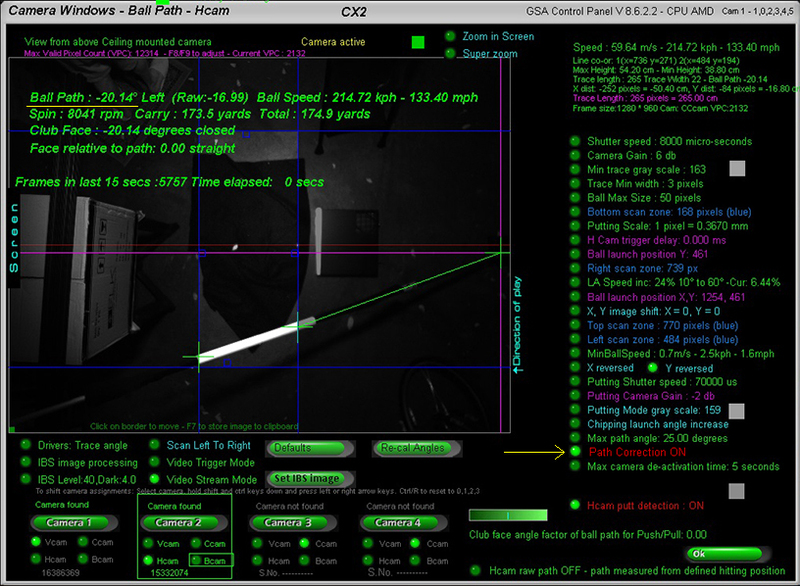 The RAW ball path measured by the Hcam in this example is -7.23 degrees left. The yellow text cursor will then select the nearest entry in the table to -7 degrees. 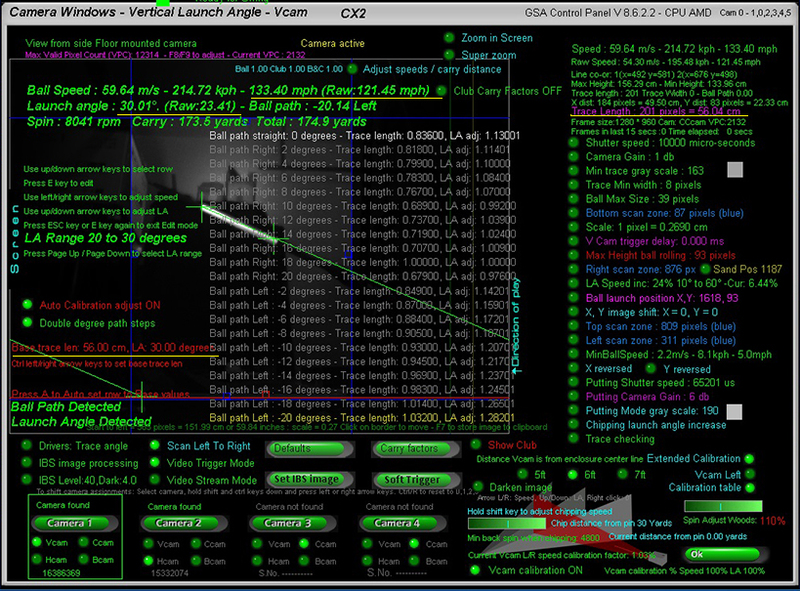 and the measured Launch angle (shown in large green text at the top of the screen) is the same as the real launch angle as read from the tilt meter. Continue the process until all 120 LA and Path position entries have been made. Note that when calibrating, ensure that all other speed and LA adjustments are off. i.e. Carry factors are set to OFF. Note that there are a number of new features in the Vcam window. 2. 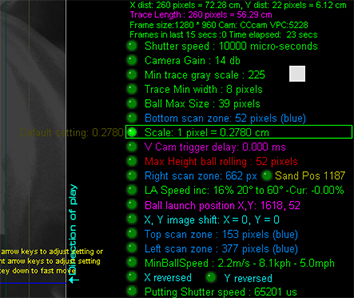 A Darken image option is now available that darkens the Vcam image so thet the calibration table is more readable. With the auto calibration mode ON, the calibration process will automatically set the trace distance and LA corrections for you. be set in video stream mode - then switch to the Vcam. 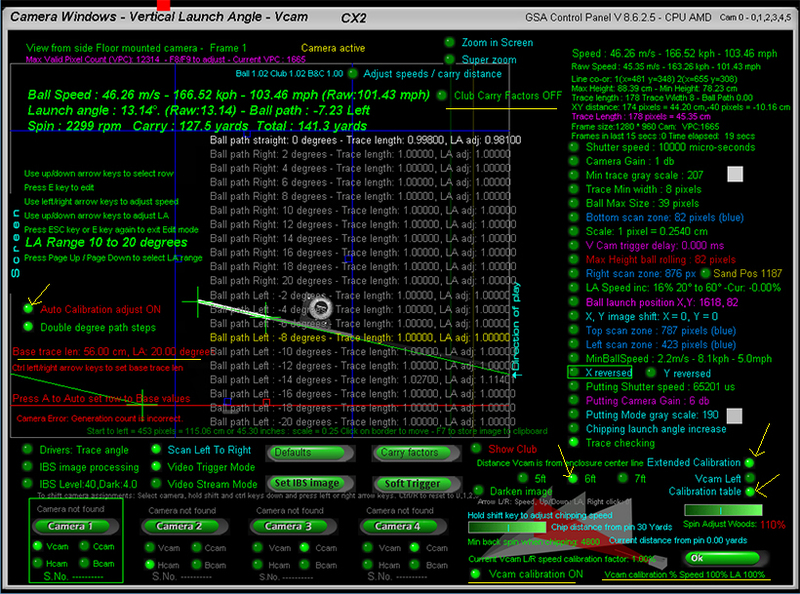 Hcam window again for the next path angle and/ or launch angle. You will see that the Hcam is already in video stream mode. 2. Move the pole to zero degrees path. The path angle of the pole will automatically be shown in degrees as you move the pole left and right. 3. Switch to the Vcam. You should now see that the LA is automatically set to 10 degrees and trace length to your base trace length. Once complete, adjust the pole to 20 degrees and use the page up/down keys to go to the 10 to 20 degree range. Start the left right pole path procedure again. To speed up calibration even further, you can switch between the Vcam and Hcam by simply pressing the "Space" bar on the keyboard. This saves you the time it would normally take to switch cameras with the mouse. And instead of having to look at the screen to see if the auto calibration worked for each angle step every-time, there's now an audible beep that tells you all is OK. In this example, the pole was angled at 30 degrees vertically and 20 degrees left. The trace length measured by the camera was smaller than the 56 cm so the correction value was automatically set to 1.032. The trace length dictates the speed of the ball and before calibration the measured speed (Raw speed) was only 121.45 mph. After calibration. speed was up to 133.4 mph. 1. When setting the pole vertical angle, ensure that the angled measured with the tilt meter is no greater than the selected vertical range. and that the measured raw vertical launch angle stays below the LA range max. that negates any user requirement to calibrate the cameras themselves. Vcam distances from the center line are 5ft, 6ft and 7ft. Note that the calibration table "calibLRex.csv" is placed in the "C:\Program Files (x86)\GSAControlPanel\data" folder when you download the latest CP update. In order to use it, the new "Factory Calibration" option must be on. Any user calibration tables won't be overwritten when this option is on but if you would like to edit the factory tables then switch the "Factory Calibration" option OFF again before editing. The table will then be automatically saved to the "C:Users\Public" folder. 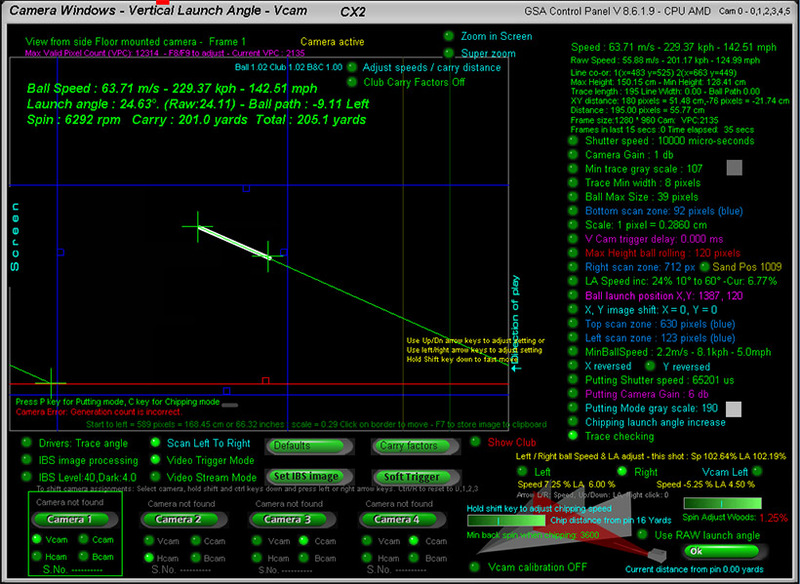 The calibration factors used for the current shot are now displayed in the Vcam window. These are Speed adjustment, Launch Angle (LA) adjustment and the index number into the calibration table. Note that the Scale factor for the calibration tables was set to 1 pixel = 0.2780. 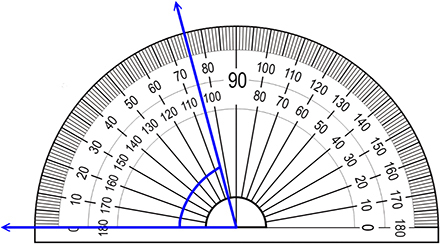 This scale factor used with the calibration tables should result in exact ball speed measurements across the entire 0 - 60 degree launch angle and +/- 20 degree path range. Increasing or decreasing this scale will result in decreased or increased measured ball speed across the entire range should you care to change it. Currently distances are 5ft, 6ft and 7 ft. If your Vcam is over 7 ft away from the center line then just use 7ft setting for now. Note that the calibration tables where made with a ball to trigger distance of 5ft.